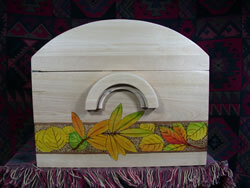 Many years ago I was asked to make a small box to be used as a place to place baby memory items. 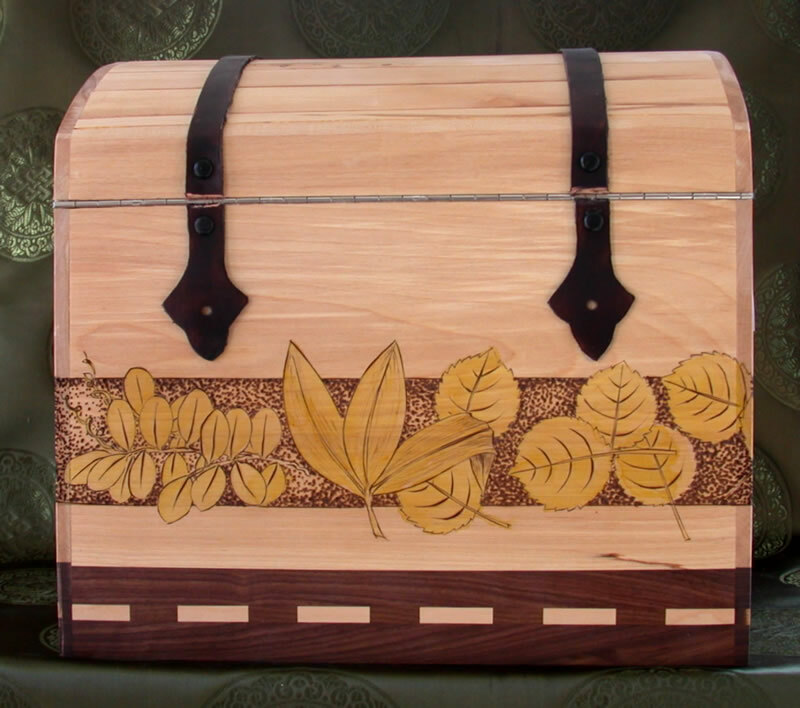 I was asked to make it look like a treasure chest. 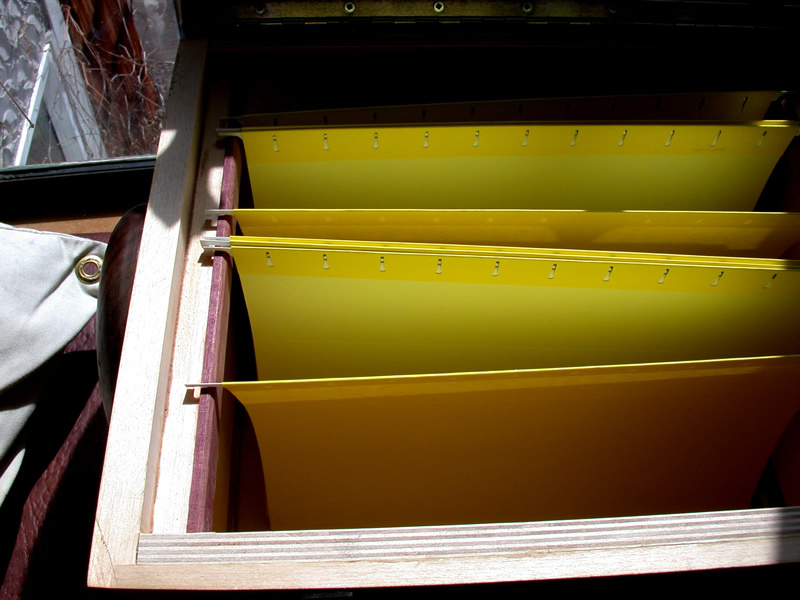 I considered construction issues and went to Lee Valley to purchase a set of cove and bead router bits so that I could make interocking slats that could form a solid curved lid. 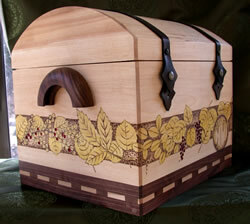 At the time I did not realize how many additional such "Memory Boxes" of that style I would be asked to make. I have made them in vafrious sizes and for all kinds of purposes, though the "memory box" function seems to be the most enduring purpose. 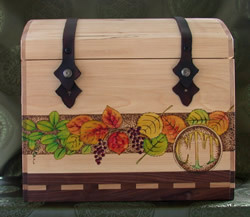 I have a few that I use at Friendly Forest; to hold string and cord, to hold file folders in which I sort my montly bills and invoices awaiting entry into a computer program, a chest to hold napkin rings and napkins, and another that hold special books awaiting time to be read. 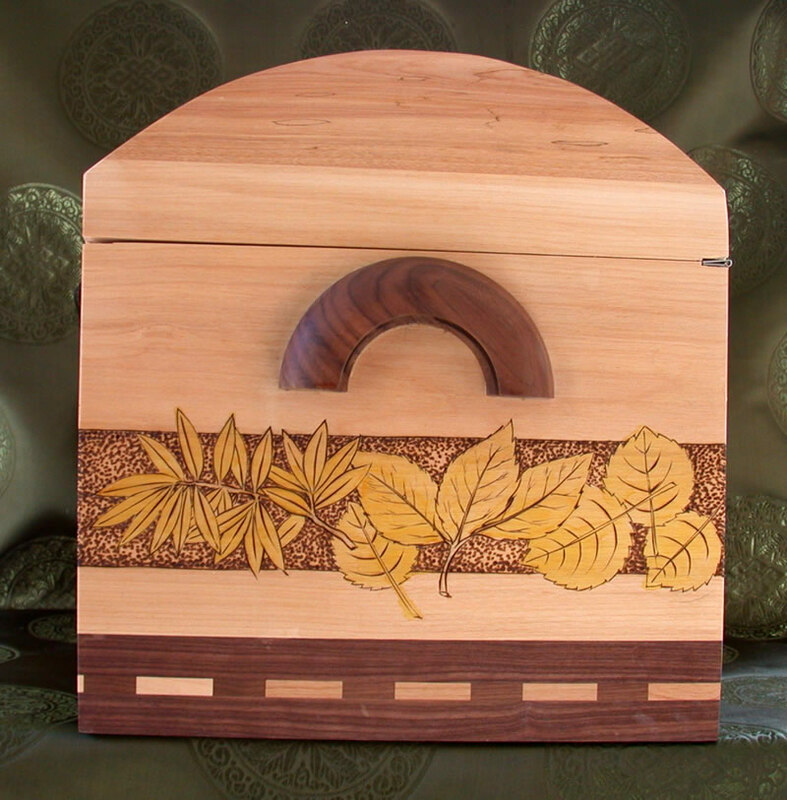 I did not have any for sale over the past year. 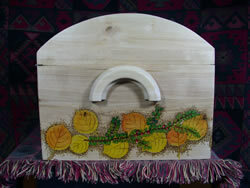 Then I started to get requests and I started to make some more. 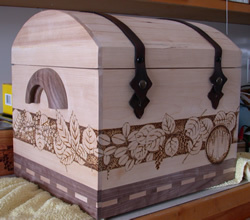 Essentially, the chest is a box with one domed side. 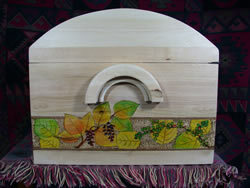 The domed side is cut off and hinged to the main part. 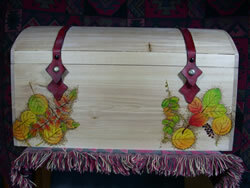 I add leather strapping for decorative effect though it is not needed for strength. 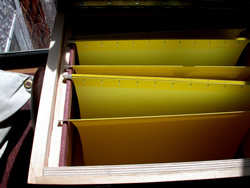 The straps are made of cow hide and dyed a suitable colour using the aniline dyes I use for various pruposes. 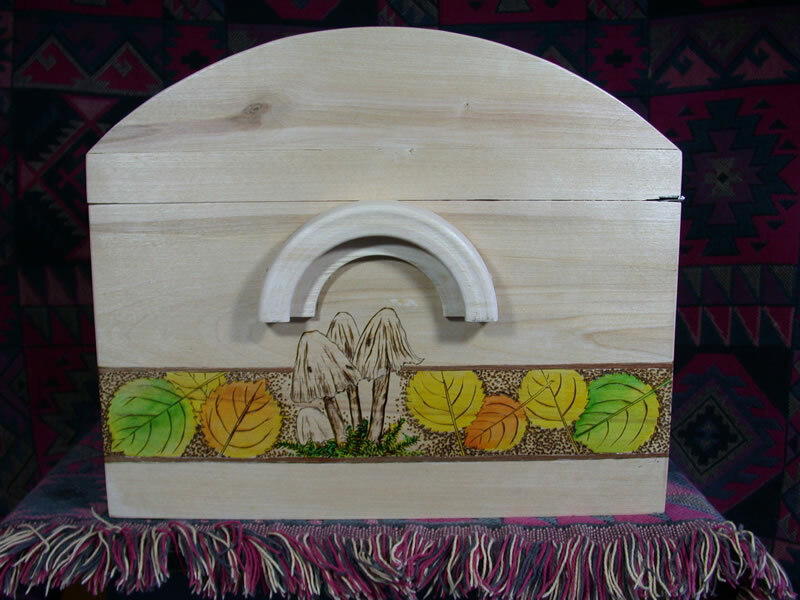 I have added low-relief carvings or added decorative effect by laminating different woods and patterned woods into the boards that I use for the box sides. 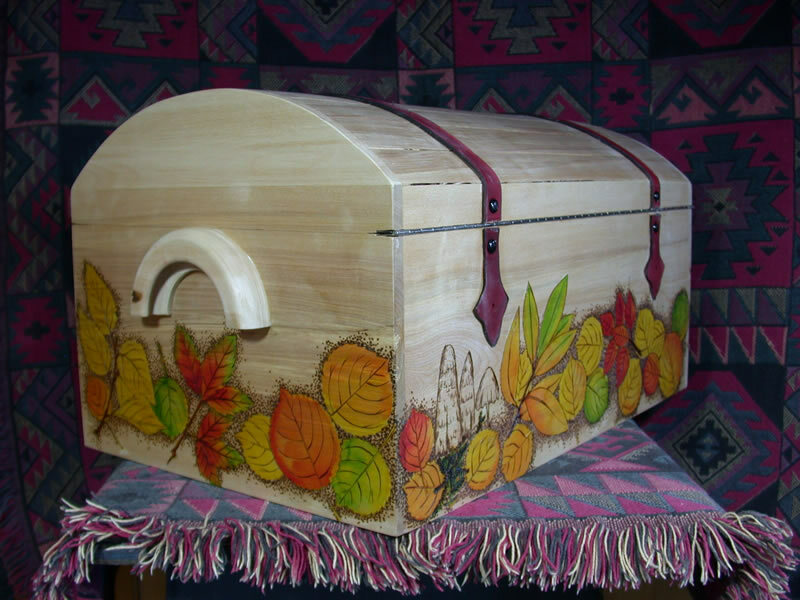 As arthritis has limited my capacity to do the carving, I have shifted to pyrography to add decoration or other detail to ther boxes. 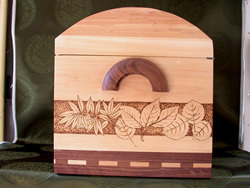 I especially like to add images of plants that live here in this forest land. 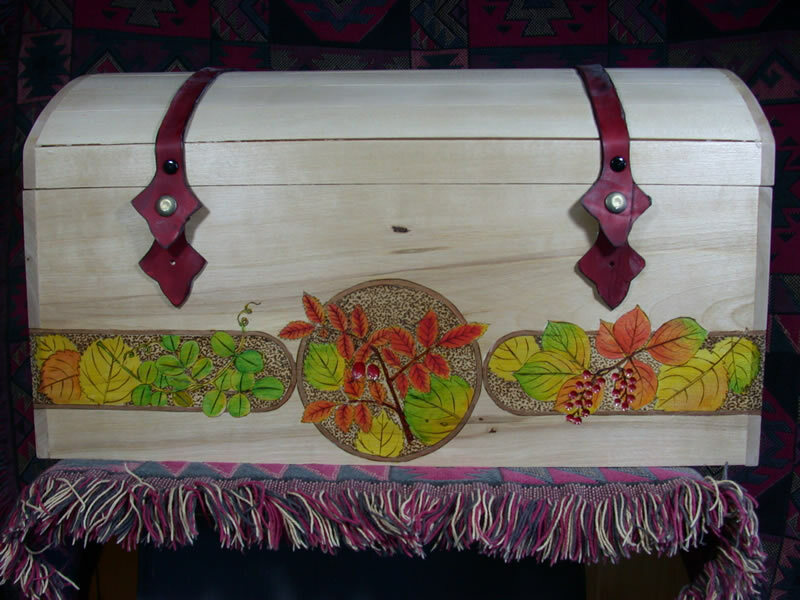 The natural , and yet abstract character of fallen leaves and ground over plants is an ever-changing kaidescope of colour and images that give inspiration for the decorations. 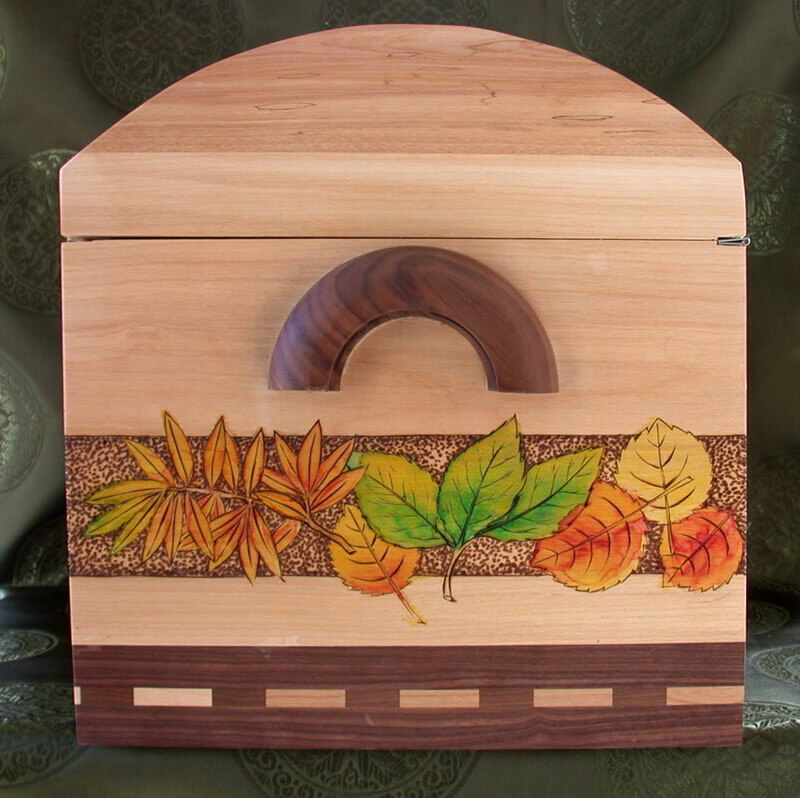 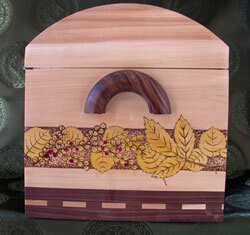 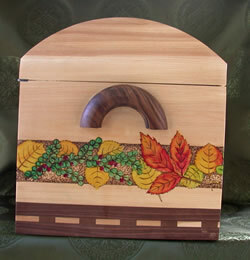 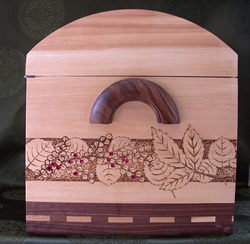 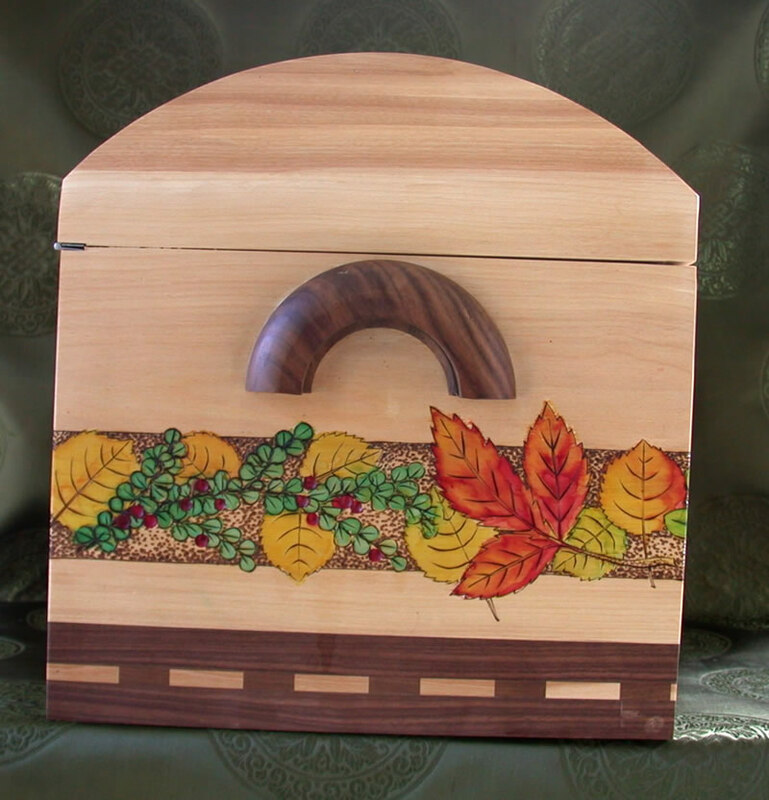 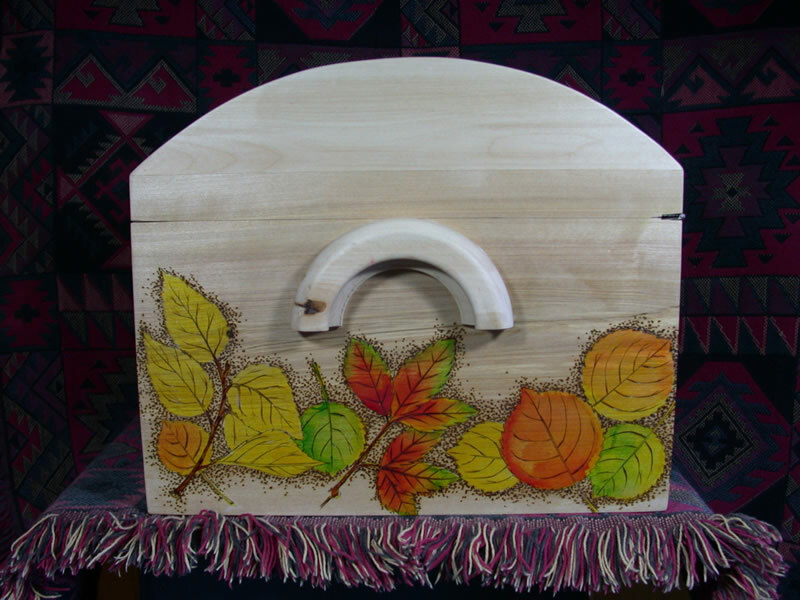 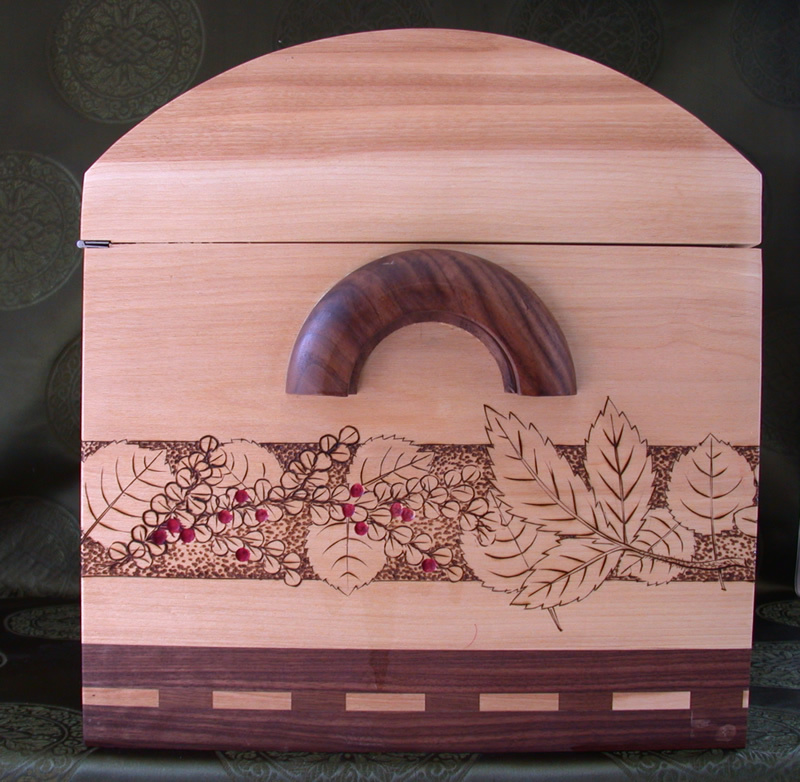 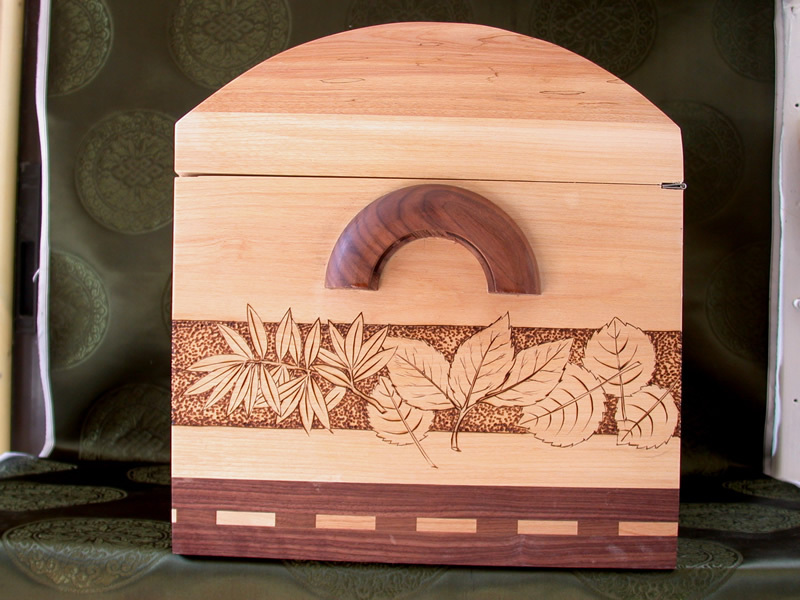 I will add images of the decoration sequence of three custom boxes completed in Novemeber 2013. At another time I might photograph the construction sequence as well and add those images. 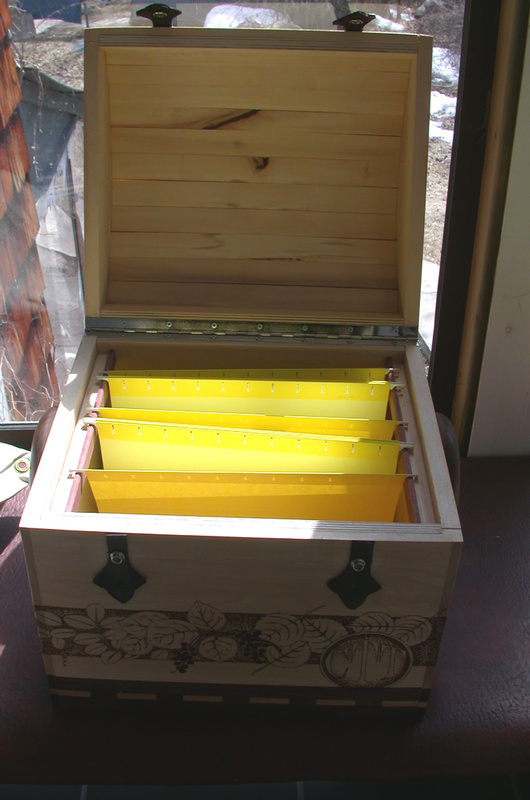 Custom "Office in a Box" chest. This was a request for letter size hanging files in a box with Birch and Walnut wood and a leaf frieze . 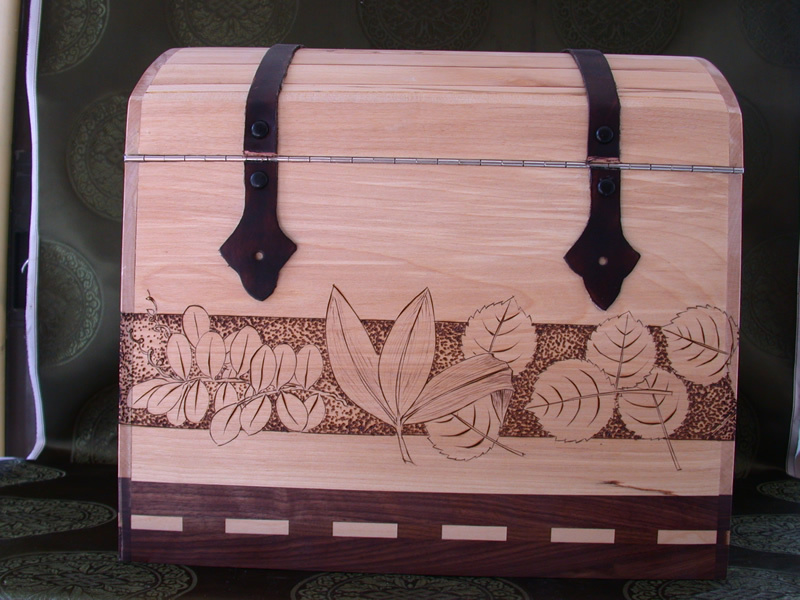 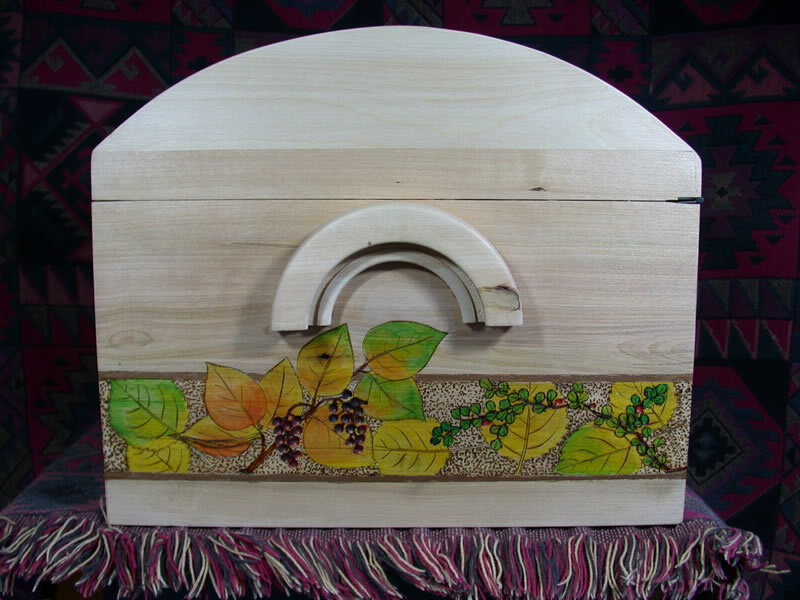 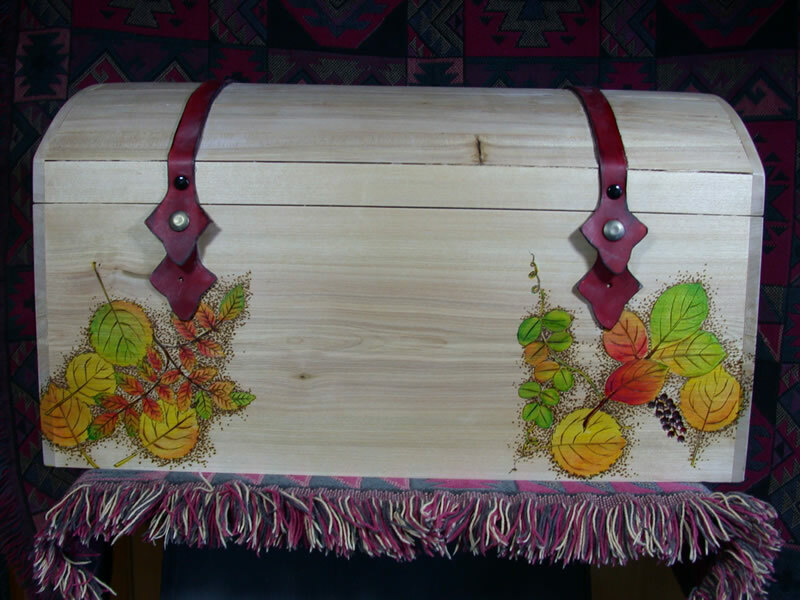 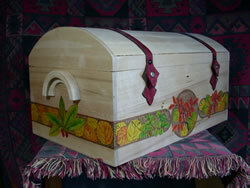 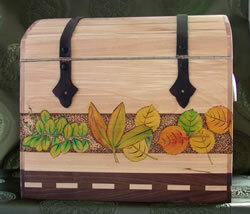 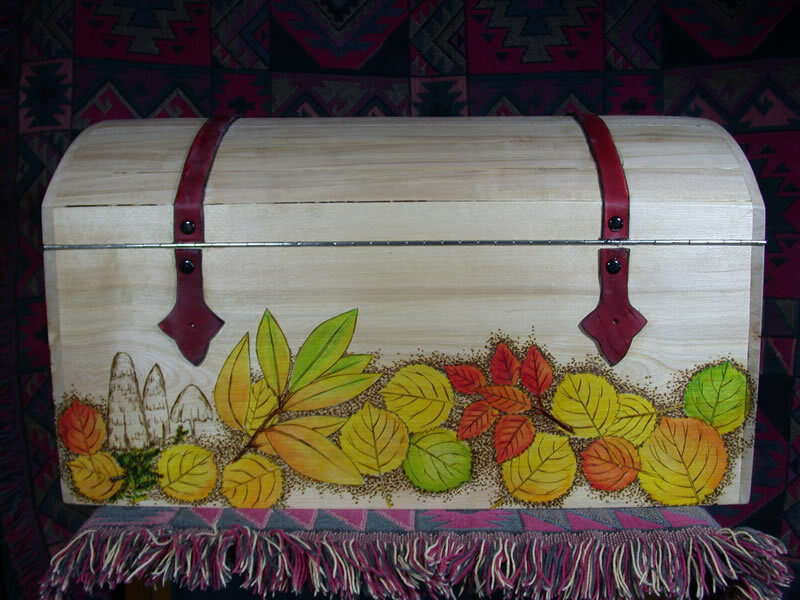 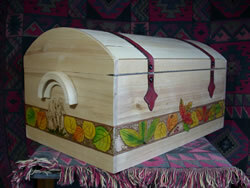 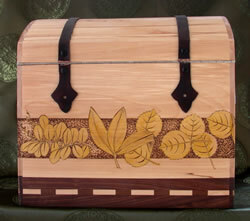 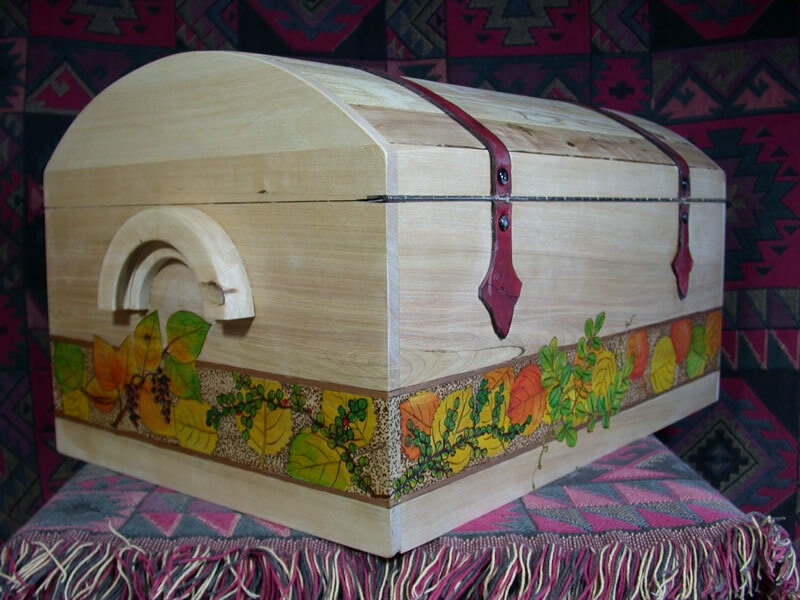 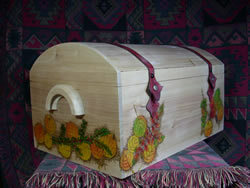 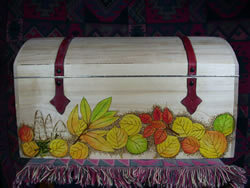 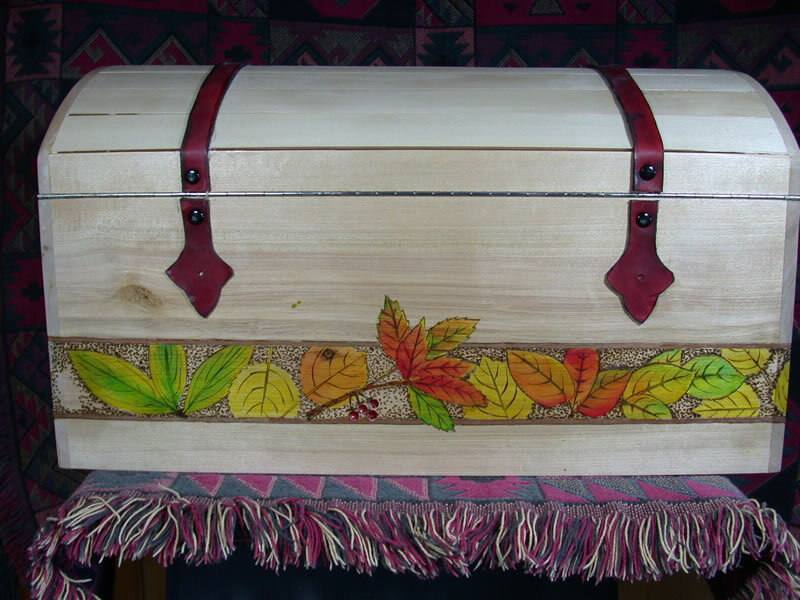 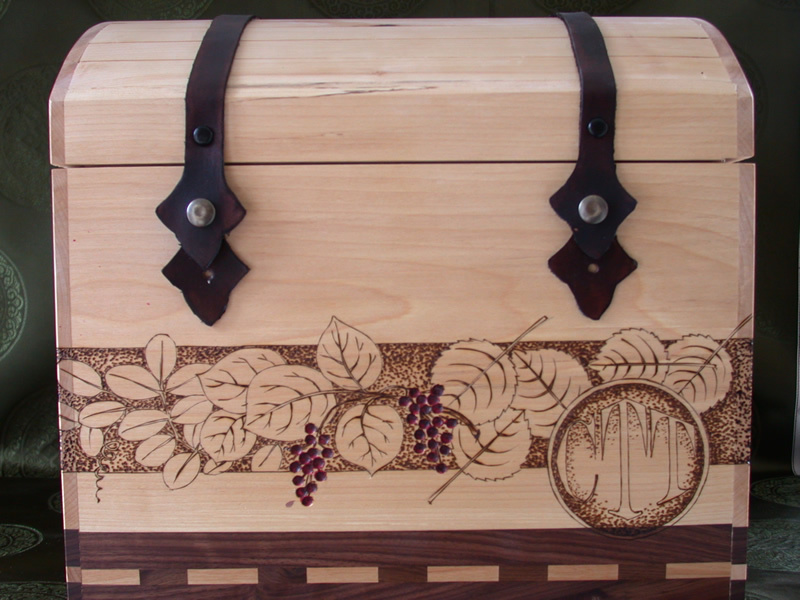 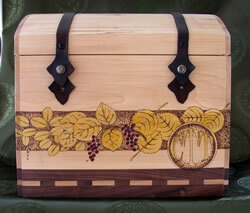 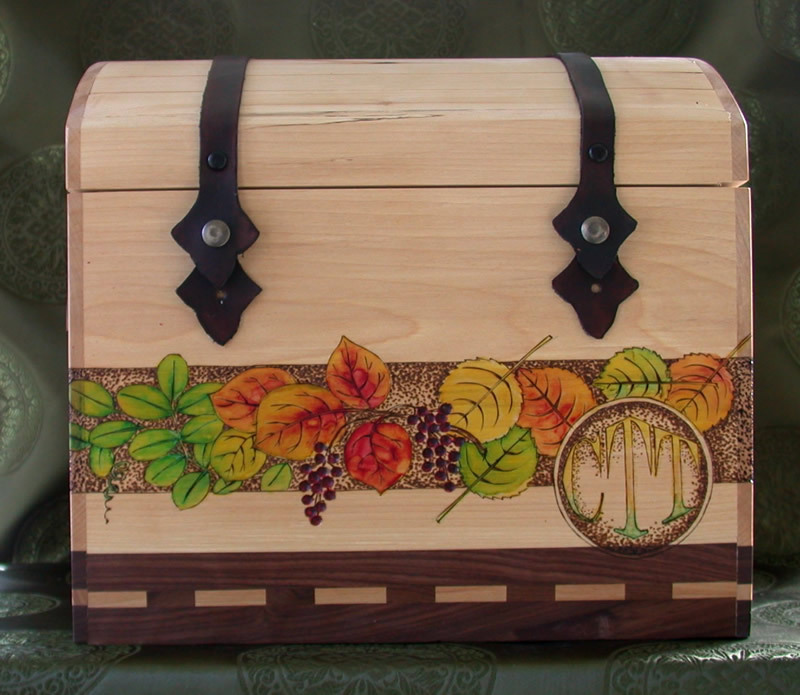 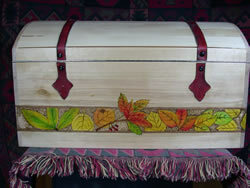 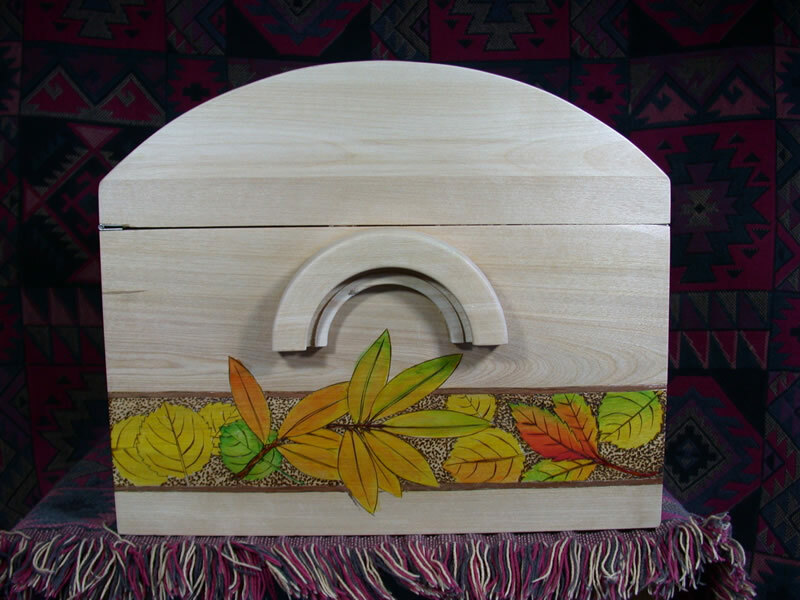 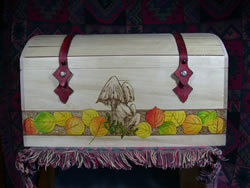 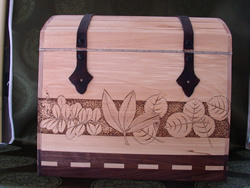 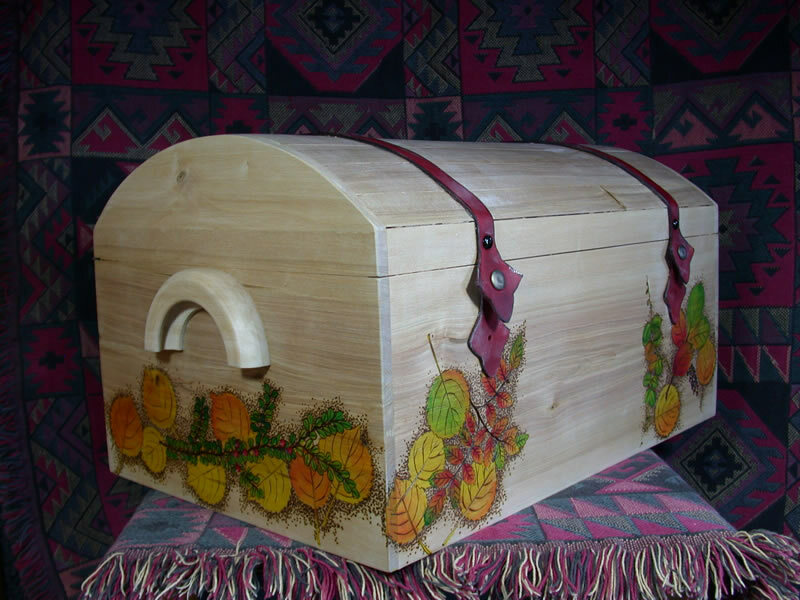 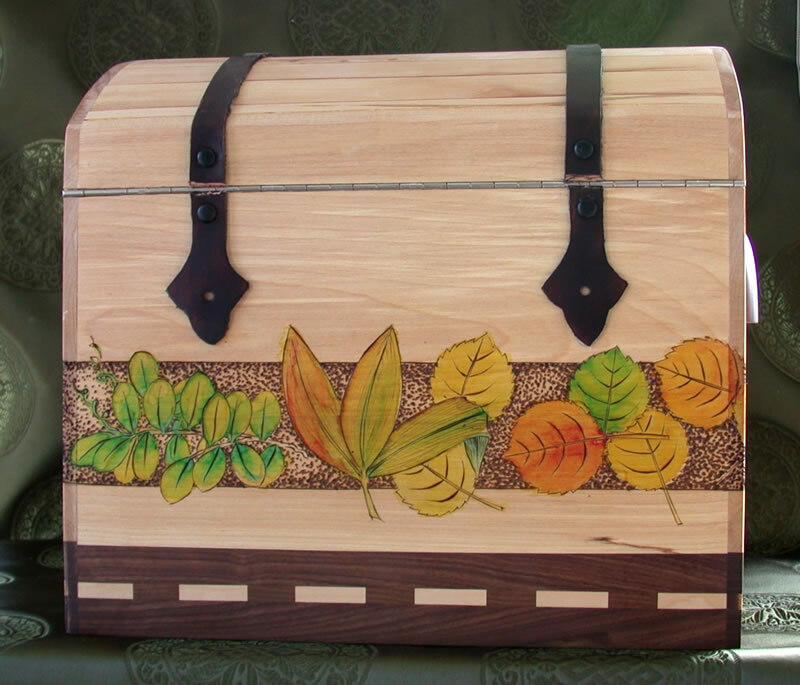 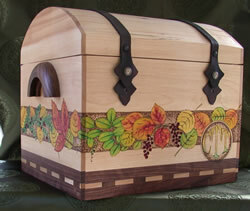 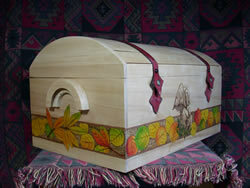 The following images are the chest with the images added with pyrography, the wood was then sealed with several coats of laquer, and then a base coat of transparent yellow aniline dye was added. 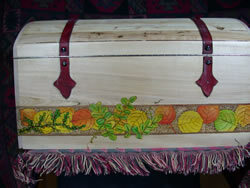 After that green, orange and red were added and blended. The BearBerry berries are red and the Chokecherries are a mix of red and blue dye colours.